When we went to Chiloé on our January missions trip we stopped for a few hours in Castro, the capital of the island. Chiloé is known for many things, and although we were only in Castro for a couple hours, we were able to see many of them. I was in Castro for two hours, but here you can see it in six photos. 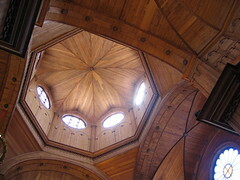 The wooden churches in Chiloé are magnificent and numerous. They were built by Spanish conquistadors and Jesuit missions throughout the island. Today they are a UNESCO World Heritage Site. 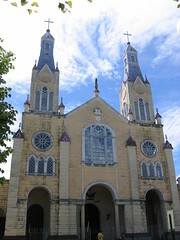 The cathedral in Castro is a prime example of these wooden churches. It’s nice looking from the outside, but the wood work inside is stunning. 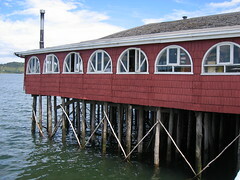 Chiloé is also known for palofitos, elevated houses built on wooden supports. 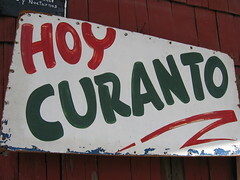 This particular one that we saw in Castro was a restaurant where we ate lunch. You might imagine that you would eat excellent seafood while dining on a small island in the Pacific. And if you imagined that, you would be correct. 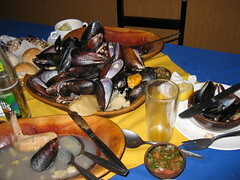 Chiloé is famous in particular for its curanto or shellfish stew. 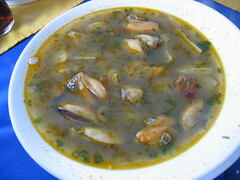 We opted for the more economical caldillo de marisco, a light shellfish soup, but fortunately another group of people at our restaurant ordered curanto and left all the shells at their table to be photographed (perhaps unknowingly). The leftover shells from the curanto feast our neighbors had. My tasty caldillo de marisco. After our pitstop, we piled back on the bus and continued south to Queilén on our missions trip. Looks like a wonderful trip Ryan. You’re doing great things!